In the ancient period of Japan, people believed that magically signified power resided in a thin stick and the devil could be exorcised by inserting it into hair. 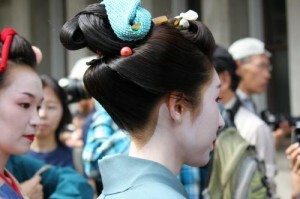 The stick used like a lucky charm rather than the hair ornament is called “hair inserting” (Kamizashi). It is said to be the etymology of the Japanese ornamental hairpin. On the other hand, in the Heian era(794 – 1185 A.D./C.E. ), man and woman decorated a flower and the branches and leaves their head for gaving glory to God at festivals . It was a custom to attend. 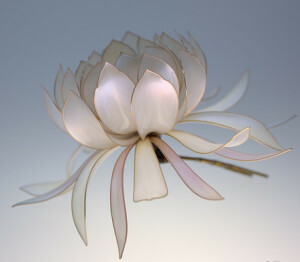 There is the opinion that the sound of “flower inserting (Kazashi)” transformed as an “ornamental hairpin (Kanzashi)”. While various culture flowed in from China, the hairpin which was the model of the current comb was transmitted from Chine, when the Nara era(AD 710 -794) began. 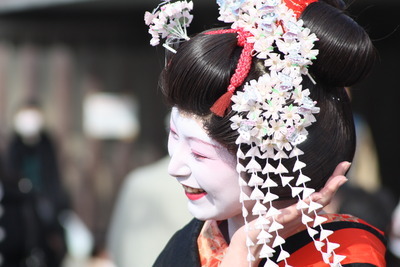 In addition, there was the custom that man and woman dressed a chignon in China, and the culture of the hairdressing was imported to Japan, and man and woman dressed a chignon in Japan too. However, when it was the Heian era, straight hair style, without bundling up hair,was became popular. The hair ornaments such as an ornamental hairpin or the comb was decline. 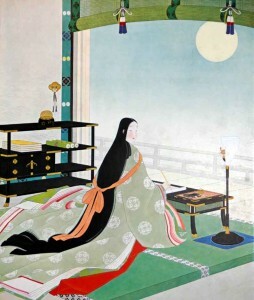 The straight hair style of the Japanese woman was mainstream for a long time. Then a low ponytail style greatly accomplished a change to hairdressing again in the Azuchimomoyama era(1568–1600). Women who had high social position were still straight hair style. However, general people did functional hairdressing such as “ Sagegami, a low ponytail” which is bundled up a low ponytail, and “Karawa” which rounded hair like a dumpling to the parietal area was transmitted from China. Those hair style did not disturb their work, when people worked. When the Edo era (1603 -1867) begins, the hairdressing that variously of artistic style were came up. After the middle of Edo era, as a chignon became more and more gorgeous various form, various decoration methods of ornamental hairpin were born. Furthermore, various materials such as ivory and tortoise shell, a horse nail, gold, silver were used, so a great variety of ornamental hairpins came to be made. At all rank, the ornamental hairpin becomes the necessities of the fashion of the woman. 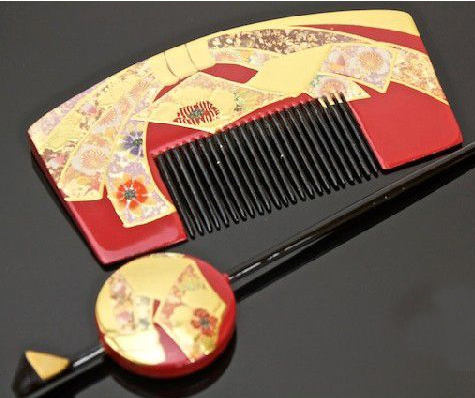 in the 1700s, in the last of Edo era, it became the biggest prosperity and the decoration craftsman who was specialised in a hair ornament did a technological advancement. Various kinds and form of ornamental hairpins were founded. In addition, the gorgeous style, that put 3 or 4 ornamental hairpins in right and left of the hair, was boom at the time. As harlots (Yujo or Geisha), who was a fashion leader at that time, did it a lot. When Meiji era was began, the hairstyle changed from a Japanese coiffure to a Western-style hairdo while westernisation was promoted rapidly. The ornamental hairpin culture declines with this social condition, too. However, the ornamental hairpin of the free style design, that is not constrained by tradition, comes up by young generation recently. 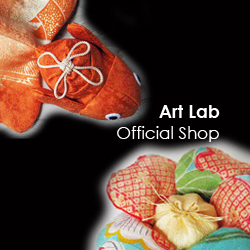 It revives as hair accessories which matched with not only the Japanese clothes but also Western clothes.